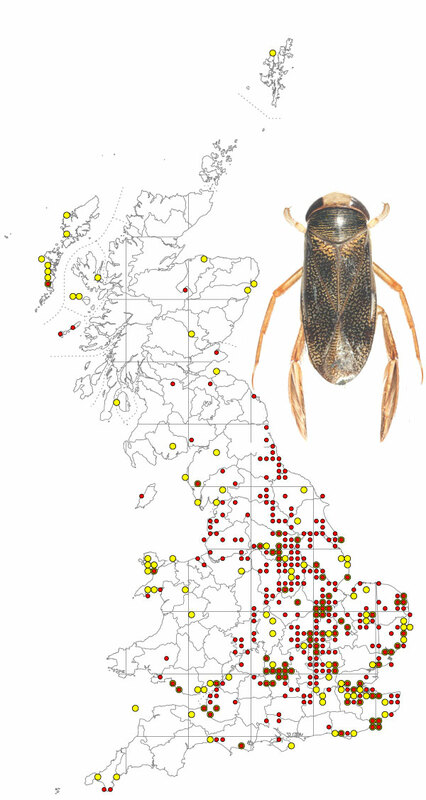 Corixa panzeri is widely distributed in the UK, but seldom abundant. The bug has a preference for alkaline ponds and lakes, sometimes weakly saline, with a water depth of 50 cm or more and a low organic matter content. Adults generally overwinter (although nymphs have been found overwintering in bottom mud) and oviposit in April. Egg and nymphal development takes 2 to 2.5 months and the resulting adults may give rise to a second generation. It is possible that first generation adults and second generation nymphs overwinter, but evidence for this is uncertain. C. panzeri feeds on algae and chironomid larvae and is sometimes predated by fish. The map is based on records from NBN Gateway, with yellow dots showing pre 1990 records, reds dots 1990 – 2015 records and red on yellow dots overlapping records. C. panzeri is widely distributed in Ireland. C. panzeri is 10.5 – 11.0 mm in length, slightly smaller than the other common Corixa species (C. punctata and C. dentipes) but larger than the less common C. affinis (which is mainly coastal and not more than 9.0 mm in length). In C. panzeri the claw of the middle leg is generally as long or longer than the tarsus and there are up to 14 pale lines on the pronotum while in both C. punctata and C. dentipes the claw is shorter than the tarsus and there are 15 or more pale lines on the pronotum.